talented squad for 2019 was selected. across 5 centres and a separate online application track. A summary of happenings at the World Schools Debating Championships (WSDC) 2018 held at Zagreb, Croatia. The Indian Schools Debating Society (ISDS) is a not-for-profit organization, powered by the Ramco Group of Companies, that aims to take competitive debating to students across India. Since its inception in 2008 in Chennai, when a mere 5 schools came together to learn debating, ISDS has taken on activities every year to encourage students bloom into mature and politically involved problem solvers. 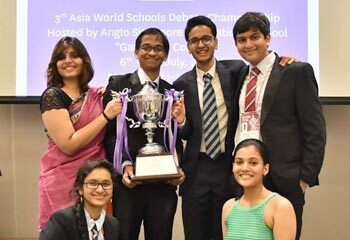 A pioneer in bringing the ‘World Schools Debating Championship’ format of debating to India, ISDS continually trains young Indians with the assistance of the best debaters from around the world, creating a new pool of ever growing fierce Indian debaters that are eager to give back. I was fourteen when I was first introduced to debating by ISDS and the love of knowledge and debating that the training and experience gave me is still an important part of who I am. Debating genuinely changed my life. It has forced me to challenge my assumptions about the world…and myself – who I am, how hard I can work and what I can achieve if I push myself. In my 8 years of debating, both as a debater and a coach, I’ve come to watch the lives of young people transform. It is a beautiful maturation that I wish every child in this country will one day have access to. Debating is fun and rewarding while you’re at it, and international debating leaves you with a wonderful network of friends from across the world.